This past weekend, the message in the Hard Truths series was on pride. Ugh. It really struck a nerve with me. Not in a bad way, but in a convicting way. If we are honest with ourselves, we all can use a little work in the pride arena. For me, it is a daily struggle to make sure that I am less and He is more. I have found that one of the best tools to combat pride is cultivating the daily habit of spending intentional time in scripture. So today I wanted to write about something that has been instrumental in my life: spending daily time in scripture and capturing God’s wisdom in a spiritual journal. I truly believe that the habit of journaling has gotten me through some of the darkest days in my life. Sometime in 2008, I descended into the abyss of depression. It started with insomnia and progressed to feelings of complete worthlessness accompanied with daily prayers for God to somehow kill me. Too proud to get help, I simply existed for the next four years. Not only was I too proud to get help, I was too proud to accept help, as everyone close to me knew something was very, very wrong. Through this darkness, the one thing I held on to was spending thirty minutes every morning at a local coffee shop with my Bible and my journal. If you asked me why I kept doing this, I can’t give you a reason – other than it had to be God compelling me to keep going. The darker the depression got, the more I craved the thirty minutes every morning. As I look back at my journals from this time, I find them excruciating to read, yet they have become one of my most treasured possessions. As I look at them, I am instantly reminded how, even through the darkness, God was still there. For me it was THE vital lifeline that kept me connected to the one thing that could give me any sense of worth. My journals have become my repository of wisdom that God is trying to teach me through His word. Like taking notes during a classroom lecture, my journals have become something to fall back on when the inevitable “tests” of life happen. Often, when I am presented with such a “test”, I can remember journaling about a verse of scripture that applies to the situation. A Bible – This can be a real, physical Bible in your preferred translation (we use New International Version at Fellowship of the Parks) or an electronic version via the Bible app. I have purchased a daily reading bible on my Kindle that I use daily (yes I still use a Kindle, I find having a separate device makes me less prone the distractions of checking my email or surfing the web). 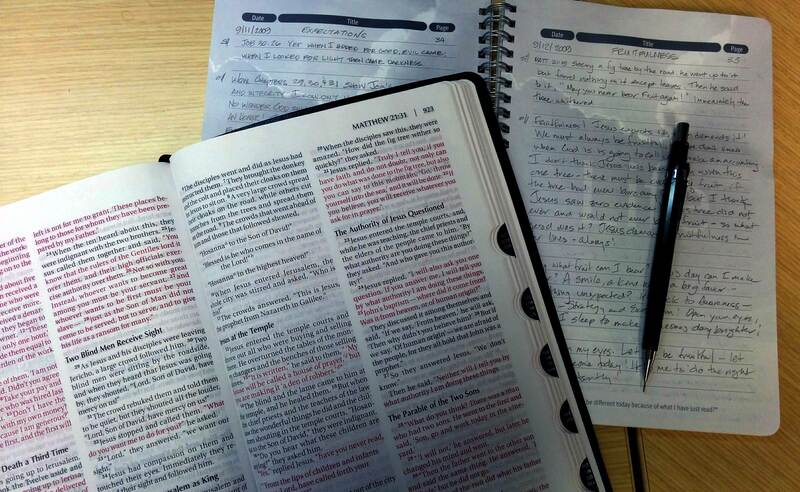 A Reading Plan – Find a good reading plan to direct your daily scripture reading. Reading the Bible randomly is seldom a good idea as it will be difficult to get the full context of the Bible. My recommendation it to find a good annual reading plan, where you read through the Bible in the course of a year. A good source of reading plans is the Bible app on your smartphone or tablet or at bible.com. Look for one that has something from both the Old and New Testaments every day. I purchased a daily reading Bible, which has the entire Bible broken up into 365 chunks, so it is the Bible and the Reading Plan in one package! A Pen – You need something to write with! A Journal – this can be any blank notebook. I currently use a journal I purchased from Fellowship of the Parks for my journaling. It can be anything, from a spiral bound notebook to a Moleskine. Start with prayer. Pray for God to make His presence felt through your scripture reading today. Pray that the Holy Spirit will direct your time and direct you to a particular piece of wisdom from His word. Open your Bible and read the scripture specified by your chosen reading plan. In the course of your reading, be alert for a verse or two that speaks to you. Often a verse will jump off the page at you. It is as if the Holy Spirit is telling you “This is just for you – here is a promise you need to hold on to” or “This is some instruction you need to heed”. I would recommend keeping your selected scripture for the day relatively short – a verse or two, maybe three at most. This helps you focus in on the single nugget of wisdom God wants you to get for the day! After completing your reading, open your journal and start writing! Now, before you get started in this, I need to tell you that journaling is not like a diary – it is not just a set of random thoughts. One of the things that really helped me in my journaling was a technique I learned long before I fell into my depression. This technique gave structure to my journal, helping me focus on what God was trying to teach me for the day. The technique can be summarized with the acronym SOAP. Scripture: Simply write down, word for word (including the reference) the scripture that jumped out at you in the course of your reading. Observation: This could be a note on the context of the verses you chose, or it could be some background of why you chose the passage to journal on. It could be an explanation of the light bulb that went off in your head as you read it – or it could be all of the above! This section usually ranges from few sentences to a full paragraph. Application: A plan of how you will put this into practice. Try to answer this question: How will you be different today as a result of what you’ve just read? Or, more directly: How does this verse apply to me today? A good way to start this is “Today I will …“. Prayer: Write down a prayer that directly relates to the application you noted down. By writing out the application as a prayer, it helps cement everything that’s just happened in your mind and heart. Make sure to thank Him for the power of His word! That’s it! For me, this daily practice helps keep my ego in check so there is less of me and more of Him in my day! Thanks for sharing your story and more importantly, the ways in which God came through in your darkest times. I’ve never been a journal-keeper, but I just may start after reading this. Hey Chuck – I didn’t think I was a journal-keeper either, until I actually started doing it everyday. By actually sitting down and writing it down, it forces my mind to structure my thoughts, which just “thinking” about it doesn’t do. By actually writing down an application, it forces me to think through what it actually looks like! It really helps focus my day on “the one thing”. Love the straight forward language in this proverb – it gave me a chuckle to see that the Bible actually calls somebody out as being “stupid”. This one really hits close to home. One of my many faults is my ability to accept correction. I was just talking about this in our LifeGroup last night – that having my work looked over is one of the most difficult things for me. My pride can completely get the better of me whenever someone finds fault in my work! Instead of accepting responsibility, my first inclination is to find someone or something to blame! That is indeed stupid. How can I apply this today? I will first of all invite somebody to look over my work. Secondly, I will accept all correction offered, not as a questioning of my ability, but as a chance to be better. The biggest principle I need to apply from today forward is to reframe correction as not an attack, but as an opportunity to improve! Lord, give me the courage to ask for review of my work, and more importantly, drop my defensiveness, my pride, when offered correction. Let me see you working to make me better through the correction of others! Lord, I thank you for your words today, I thank you for constantly speaking into my life and offering me loving correction! Thank you so much for this Don! I was wondering how I should go about journaling – you answered my questions with the SOAP anagram – perfect! Good write up Mr. Don. Don, I love your straightforward description of journaling and spending time in God’s word. I’ve always loved journaling, but this brings a lot of meaning and purpose to how it’s done. It doesn’t have to be complicated or overthought! Thanks for sharing. Don, I am encouraged by your faith in God! Thank you for sharing your story and the journaling process. I never thought of journaling in this way! Thanks, Don. I appreciate your openness and willingness to share. Thank you Don. Your example of journaling helps me a lot! You’re a great communicator and this piece you’ve written is inspiring and insightful. We are so grateful for your transparency and wisdom that you share! I love this, and I want to do it. What is the best plan? I have found a few, but they are WAY more than just a few verses per day. Yes, all of the “read through the Bible in a year” plans will be three to four chapters per day. For me, having multiple chapters of gives me enough variety to zero in on a verse or two for the day. If you are looking for something shorter to get started, look at some of the “devotional” plans on bible.com. They usually have a story of some type (not from the Bible) with a verse from the Bible or two to read for the day. Another great way to get started is to read 1 chapter out of the book of Proverbs for 31 days. Since there are 31 chapters in Proverbs this fits perfectly into a month – so if today is March 21, read Proverbs 21 and then zero in on a verse or two out of that chapter to journal on. I do recommend setting a goal of reading the Bible in its entirety at least once (and hopefully multiple times) in your life, as there is a lot of insight to be gained by going through the entire context of the Bible. I use the kindle edition of the “Grace for the Moment” Daily Bible by Max Lucado for my daily reading/plan. It is 3-4 chapters per day, usually a couple out of the Old Testament, some verses from Psalms, a verse or two from Proverbs and a chapter from the New Testament. It take me about 10-15 minutes to read and then another 10-15 minutes to journal daily. In past years, I have used the “Life Journal Plan” (Available on bible.com – incidentally, the Life Journal is where I learned the SOAP technique). I just noticed that there is a “First Steps Reading Plan” by the same people who produce the Life Journal that is an abbreviated (i.e. less daily reading!) version of the Life Journal plan, also available on bible.com. Thank you for sharing your heart and your story. This S.O.A.P method has been great for me, especially on days I have no idea where to start.